Hey, y'all! It's Friday, and, as promised, my "healthy writer" blog is already up and running. So click on over and let me know what you think about body issues and adressing them. Changing the subject: Tonight the Jewish New Year begins at sundown. The holiday, Rosh HaShana--Rosh, meaning "head" or "beginning" and HaShana, meaning "the year"--celebrates the birthday of the world, or at least that's how they phrase if for the kinder (children). You can't have a holiday without food--oh, wait a sec, if you're Jewish, you CAN have a holiday without food because the next one coming up, Yom ("day") Kippur ("atonement") is supposed to be a fast day, but never mind--MOST things Jewish come with food, and Rosh HaShana has its own epicurean traditions. First and foremost that means sweet things, so that the coming year will be sweet for you. 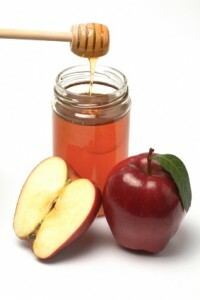 Traditionally that means apples dipped in honey--not my favorite. Now apples dipped in caramel--that works. But so messy. This year I'm eschewing all familiar tradition and posing as a Syrian (Iranian, Moroccan, you get the picture). I'm making Roast Chicken with Dried Fruits and Almonds. You can't pretend to be middle eastern without couscous, so that's my side. And for dessert, I'm substituting apples for the nectarines in this Nectarine Golden Cake, which is the kind of cake a non-baker like me can do. So give me props for experimenting. May your year be filled with the sweetness of heart, mind, and body. Enjoy your wonderful meal, Annie!